Why are some dental handpieces so expensive? That’s like asking why some cars are so expensive. I was talking to a dentist last week who mentioned that a friend of his buys $35.00 handpieces from China and when they break down after 3-4 months he just throws them away. What is the difference between that $35.00 high speed and a $1200.00 one? A lot! A craftsman does their best work with the best tools. As a dentist you are a craftsman, you restore human anatomy. 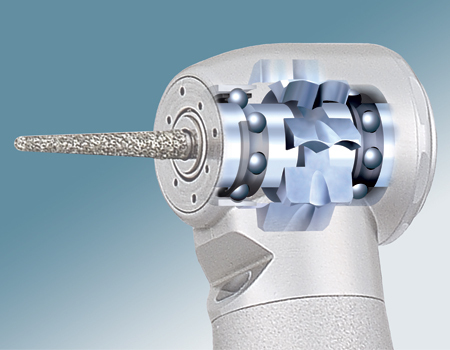 High Speed Handpieces … Carbide burs and diamond stones preform best when used with a quality tool. 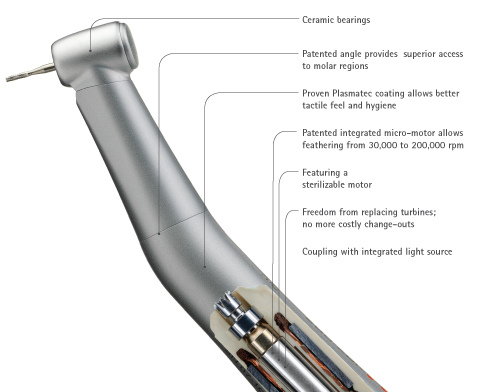 High Speed handpieces spin at 350,000 rpms, faster than a jet engine. Quality tools are laser balanced, will maintain their centricity under load and minimize or eliminate chatter. Internal components regulate air flow to maintain true cutting speed and torque for predictable performance. Quality pieces are designed ergonomically to be hand held and have a much lower decibel level offering personal health benefits to the user. Everyone has different views about high speeds but just remember, you get what you pay for. Regardless of what you spend, proper care & maintenance will increase the life of the turbine cartridge. The High Speed Turbine … This is one of the most misunderstood piece of dental equipment. Stainless steel or ceramic bearings ride inside a race (track) that is attached to a cylinder with blades (fins) that capture the air to spin the turbine. Sounds simple, but it is not. The detail engineering and specifications require a regular maintenance plan that will not reduce the life span of this little jet engine and please, keep them away for Disinfectants. Disinfection & Sterilization … If you are not using an automatic handpiece purge unit the chances are that you are not cleaning or lubricating properly. Handpieces need to be cleaned and lubricated before sterilization. Forced pressure lubrication is always better because it will clean the turbine cartridge at the same time it lubricates and by using an autoclavable lubricant you will help protect the moving components from the repeated sterilizer heat. Never use disinfectants of any kind to wipe clean a handpiece. Use plane water, they are made to get wet, and a hand scrub brush if needed. Remove the handpiece from the room before spraying or wiping counters and equipment. The disinfectants release a vapor into the air. This vapor will settle on the handpiece and degrade the metal. The Metal … Dental handpieces are made of titanium or stainless steel. Titanium is better (and more expensive) because it is lighter in weight and more resistant to sterilization but most are made of stainless steel. However, stainless steel is just that, it stains less. There are different qualities of stainless steel so you will get what you pay for. Your #1 Tool … A baseball player always uses the best glove, some even sleep with there bats. A Photographer will use the best camera available and a painter will use only the best brushes. Your high speed, low speed, air driven or electric’s are your #1 tools. You use a handpiece of some type on 99.98% of you patients. Quality tools will help you be the best you can be, they are your brushes! You can save money in a lot of places but there are three, where money should not be an issue. (1) Your overhead light (2) The stool you sit on (3) Your handpiece. Please feel free to contact me at any time with any questions or concerns.